People who inject drugs are at particular risk for hepatitis infection. Over 13 million people in the WHO European Region are living with chronic hepatitis B infection and over 15 million with chronic hepatitis C infection. Two-thirds of those infected are in eastern Europe and Central Asia. Hepatitis B and C infections lead to 400 deaths in the Region every day. "These tragic deaths from hepatitis could be prevented by halting new infections and improving testing and access to treatment for those infected. This means stopping unsafe blood transfusions and injection practices, vaccinating children against hepatitis B, and making sure that those most at risk get tested and receive the medicines they need to treat hepatitis B and cure hepatitis C," said Martin Donoghoe of WHO/Europe's Joint Tuberculosis, HIV/AIDS and Hepatitis Programme. WHO and partners urge policy-makers, health workers and the public to act now to prevent infection and death from hepatitis. 28 July is World Hepatitis Day. Many cases of viral hepatitis remain asymptomatic until decades after infection, slowly destroying the liver and eventually presenting as grave and deadly complications such as liver cirrhosis, liver cancer and liver failure. In most countries in the Region, the majority (in some countries, more than 75%) of people living with viral hepatitis do not know about their infection. Many became infected through blood transfusion or other medical procedures years ago when no tests were available. More than 20% of those infected will develop liver cirrhosis or cancer if these diseases are not diagnosed in time; it is estimated that over 145 000 people die from viral hepatitis-related liver disease in the Region each year. 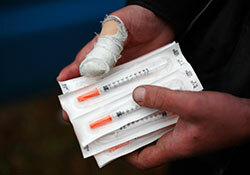 Several vulnerable population groups, particularly people who inject drugs, are at greatest risk of becoming infected. However, everyone is potentially at risk, as unsafe injections and other invasive procedures that can expose individuals to hepatitis C and hepatitis B viruses within and outside the health care sector are still given. Sexual transmission of viral hepatitis B is an ongoing issue. Universal vaccination to prevent this disease has been in place for over 20 years in most countries. Even though blood safety and safe injecting practices in health care settings have improved in recent years, the hepatitis viruses continue to spread. In the past, viral hepatitis received little attention from policy-makers. Most countries have been reluctant to address viral hepatitis, such as ensuring access to treatment and prevention to all who need them and reducing the costs of drugs and diagnostics. The level of awareness in the general public still remains very low. Vaccination of newborns is the most effective, safest way to prevent mother-to-child transmission of viral hepatitis B, and the vaccine provides protection from the infection throughout life. "People who are at risk of infection and were not vaccinated as children should seek vaccination", says Martin Donoghoe. As transmission of hepatitis C and B viruses through blood and unsafe injection practices continues in the Region, there should be scaled-up prevention programmes for vulnerable groups based on evidence-based interventions, such as harm reduction for people who inject drugs and equal access to services and treatment. Recent revolutionary treatments for chronic hepatitis C have made it possible to cure more than 90% of infected people in just 3 months, without the severe adverse effects often seen with previous treatment regimens. In response to the recent advances in the treatment and prevention of viral hepatitis and to support countries in responding to the epidemic, WHO prepared its first comprehensive guidelines for hepatitis C treatment and care in 2014 and for hepatitis B in 2015. "Unfortunately, new treatments are still unacceptably expensive and are currently inaccessible to all those in need," says Martin Donoghoe, adding, "Strong political will from both government and civil society organizations is needed to improve access to treatment and to ensure affordable prices". WHO is working on a global strategy to combat viral hepatitis, with the ambitious goals to eliminate the disease as a serious public health threat and save millions of people from chronic liver disease-related deaths. The strategy will include a comprehensive package of prevention measures and call for better access to treatment and better global awareness about viral hepatitis, the so-called "silent killer". Video - Prevent hepatitis. Act now.